Home » Cryptocurrencies » Ripple: Is XRP the future of modern banking? Ripple is a transaction protocol and network designed for currency exchange and remittance. The goal was to build an online remittance network to enable instant and nearly free global financial transactions of any size with no additional charge-backs. Ripple (XRP) is not a traditional cryptocurrency such as Litecoin. Ripple has been adopted by more than 100 global banks and online payment providers all over the world. Ripple is definitely not a world-record breaking cryptocurrency. It’s one of the most stable currencies. Since the entry to the stock exchange, Ripple has been overshadowed by its more famous cryptocurrencies. Its value was thousandths of US dollars (in early 2017 around 0.006 USD). During the first half of 2017, the value began to soar. The growth ended at 0.4 USD/XRP which did not stay too long and the price fell to 50% of its previous value. After that, Ripple has gone through a rapid sky-rocketing rise to 3 usd. To better understand the way ripple works carry on reading. Ripple as such was launched in 2012 by a California-based company, Ripple Lab (originally known under the name Opencoin). The authors are A. Britto, D. Schwartz and R. Fugger. In parallel, the concept of Ripple became a model for numerous other payment systems. Ripple is a network with a publically available code, an open-source solution. The network consisting of computers of individual users is decentralised, same as bitcoin network. There is no single server in place to control and register individual transactions. The network includes verifiers with PC software connected to the ripple network. The verifiers share a ledger, used as a book for accounting, similarly to a blockchain ledger used for bitcoin. The ledger is updated in five-second intervals. Ripple is a digital currency, used in the Ripple network. It’s also known under the abbreviation XRP and you can use it as a means of exchange for other cryptocurrencies as well as for traditional, fiat currencies. Ripple is divisible to six decimal places. Unlike Bitcoin, primarily a digital currency, ripple is a purely universal payment network. It allows the creation of tokens representing various traditional currencies (such as euro or dollar) or a handful of digital currencies (such as bitcoin or ethereum). In addition, ripple may offer access to less common options such as gold, air miles etc. The information about all bitcoin transactions are monitored In the bitcoin network. However, ripple enables monitoring of any information. In addition, you can trace back transactions with other currencies. This is rather a complement to quick and cheap settlements. 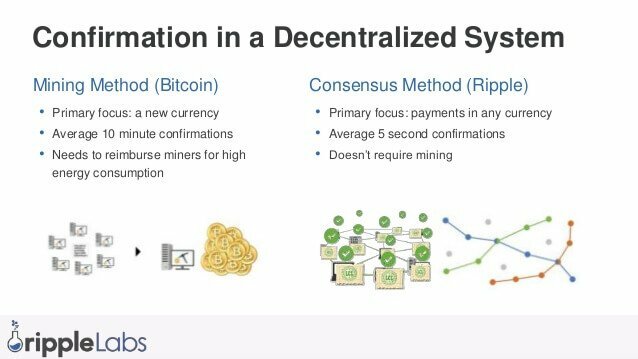 While bitcoin transactions are validated through mining, ripple uses a totally different approach. Therefore, ripple network is faster and more power-efficient. transactions are confirmed consensus-wise. Thanks to this the transaction takes a few seconds. (consensus is a process in which all entities in the network agree that a particular transaction has taken place). As mentioned above, ripple has drawn attraction of several large banks and institutional banking systems such as CBW Bank a Cross River Bank using ripple already. Further candidates are Santander and UniCredit. Banks incorporate ripple protocol to enable their clients to profit from all benefits of ripple transactions. Ripple is able to interconnect various platforms and create automated scripts. Despite its enormous growth, ripple is still more stable than bitcoin. The only way to acquire ripple is to purchase or exchange it for another currency. Ripple’s official website displays the current list of points of exchange. Although ripple cannot be used for standard payment transactions like bitcoin or litecoin, it is still a powerful cryptocurrency. During each ripple transaction a small part of XRP value is eternally destroyed. Each account in the network must have a certain balance. Each transaction is charged some minimum fee. YRP can be used in a situation which disables exchanging two different currencies. In the first step you exchange the main currency for ripple followed by step two, in which you exchange ripple for the desired currency. Ripple is also allowed for speculative trading with brokers. Compared with other currencies, ripple has not the ambition to replace bitcoin. Ripple is not being heralded a revolutionary innovation. Unlike bitcoin users considering banks as evil calling for a total dismantling of the global financial system, ripple’s aspiration is to satisfy the needs of global financial institutions. A strong proof of the cryptocurrency’s benefits is the seventy five banks from all over the world using ripple in their daily operations. If the network of ripple users continues to grow the price of ripple may grow accordingly. Ripple is surely not an anarchist’s dream currency (unlike bitcoin who has had such aspirations) yet it can offer decent evaluation. Some experts go so far to predict brighter future to cryptocurrencies such as ethereum or ripple at the cost of the current leader, bitcoin. It is difficult to assess ripple’s actual growth potential. Nevertheless it is true than since its launch in 2013 the value has grown by 3 868%. The future will show how high the price of this third most popular cryptocurrency can climb.